The crash that killed two men at the SpeedVegas racetrack south of Las Vegas in February sparked conversations within the Clark County Board of Commissioners about regulating high-risk attractions. But what kind of regulations would have helped to prevent the outcome in the SpeedVegas case? Clark County Commissioner Steve Sisolak said it feels nearly impossible to come up with regulations to fit a constantly evolving group of thrill attractions. On top of that, he said, there are challenges with having the resources and manpower with the right know-how to regulate each attraction. New Jersey is one of the few states, if not the only one, that has staff with know-how and regulations for racetrack activities, including driving experiences that operate out of a licensed racing facility. But even its regulations, managed by the state police, likely would not have changed the fates of the two men who died at the SpeedVegas driving experience, said Matthew Kowalski, who leads the Motor Vehicle Racing Control Squad of the New Jersey State Police. “Without knowing the facts behind the case, there is nothing that we have in our book that would have protected them,” Kowalski said. A tourist, 37-year-old real estate agent Craig Sherwood of Thornhill, Ontario, Canada, climbed into the driver’s seat of an orange Lamborghini Aventador on Feb. 12 after a safety briefing with 59-year-old Gil Ben-Kely, a SpeedVegas instructor, in the passenger seat. On one of the laps, the car traveled at more than 100 mph on the track’s longest straightaway paralleling Interstate 15. It then failed to negotiate an S curve, spun out of control and slammed into a barrier, where the car burst into flames, killing both occupants. Reporting by the Las Vegas Review-Journal discovered several factors that may have contributed to the crash, including a lack of regulation. None of the elements of the fast-car experience — the tracks, the cars, the instructors, the emergency response — is overseen by any local, state or federal regulators. Critics might say tracks, cars or instructors are unsafe, but if the management of a company disagrees, there’s nothing stopping it from operating any way its management wants. New Jersey state law gives the state police the authority to write and implement regulations pertaining to racetrack activity. Currently, according to the New Jersey Department of Law and Public Safety’s motor vehicle racetrack regulations, each driving experience, or any “operation” or “track” or “place” at which “motor vehicle races” are conducted, along with “exhibitions of motor vehicle driving,” must apply for a license. 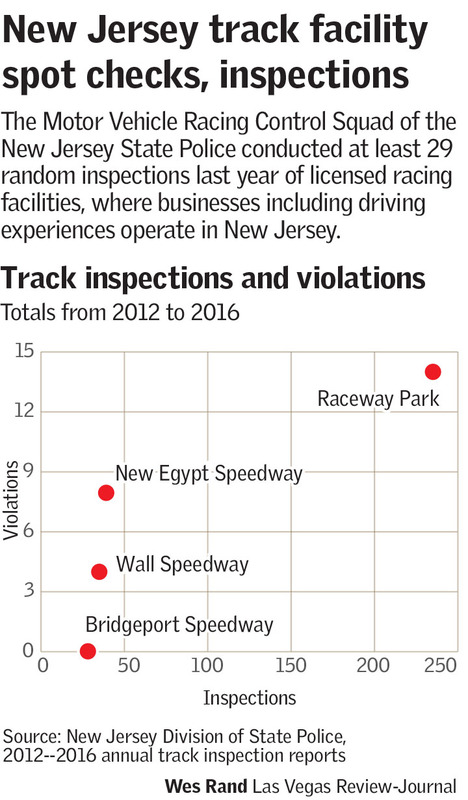 New Jersey state police can only regulate driving experiences that take place at licensed racing facilities, like a speedway. Regulations call for inspections of every fixed racing facility at the beginning of every racing season, and then random inspections throughout the season, to ensure operations and equipment compliance. Seat belts must be valid for about two years after the manufacture date on the belt. Rollover protection is required “for all open cockpit or convertible vehicles,” and the regulations spell out the type of roll bar padding required. Design and construction of the road course must be approved before it is constructed or altered. Although the New Jersey regulations look at road course construction, Kowalski said the focus is mostly on spectators. While New Jersey has implemented regulations pertaining to racetrack activity, Kowalski said a lot of the responsibility is still placed on the driving experience. “We know these are rising in popularity, and we know there’s issues there,” Kowalski said. He said he is looking into ways to better regulate driving experiences, like calling for more instructor vetting and adding more stipulations like increased driver safety protocols and restricting the speed limit on a track. “You can’t regulate it completely in my eyes, but you can try to make it safer,” he said. Sisolak said he believes the county and not the state should be involved in regulating attractions in Nevada, but he thinks it’s too expensive to put on the plate of the Metropolitan Police Department. “The county is doing its best to adopt regulations that protect the public,” Sisolak said. “As the industry evolves, we will continue to do our best to update regulations as new attractions come to be keeping in mind that public safety is of paramount concern.” However, the county is not currently adopting any specific regulations related to driving experiences or other thrill attractions. “There are always attractions coming in, and frankly, these folks are two, three steps ahead of us,” he said. He cited a Las Vegas attraction called Machine Gun Helicopters. It opened in June, offering “a true helicopter door gunner experience to the public.” The experience will allow guests to “live out their first-person shooter video game fantasies in Las Vegas” with a fully automatic belt-fed M249 SAW machine gun and multiple groups of targets. “You got me with that one,” Sisolak said. 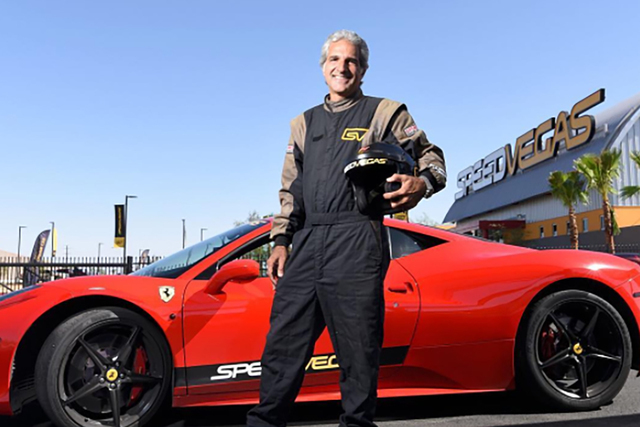 “These additional makes and models allow us to give even more people their ultimate supercar driving experience,” said SpeedVegas CEO Aaron Fessler.